Welcome. And so begins my journey into the world of audio reviewing. Although not classically trained in either writing or music, I do have a passion that I hope will be tangible in my writing. I hope to convey not just physical descriptions and observations but also a somewhat deeper understanding as to what makes a product special. I intend to take a somewhat non-traditional approach by including a discussion with the designer whenever possible. With state-of-the-art pieces, you are buying not just the nuts and bolts of construction but a piece of the designer's musical soul and, in many cases, the culmination of a life's work. Statement pieces are often more art than commercial product. Such is the case with Walker Audio's Proscenium Gold turntable and Reference phono preamp. Although they can be purchased separately, I chose to review both together. They really are a system, designed and voiced together, each used as the reference for the other and both continually updated and improved. During the past three years, I have posted many of my thoughts and observations on the Walker system on Audio Asylum. With many of you, I've had both personal and online discussions about the system. For those of you who know me, my comments today won't be new. What is really exciting, however, is my interview with Lloyd Walker. What started out as short chat for technical background information blossomed into a fascinating glimpse into the mind of one of audio's brilliant designers. Hopefully you will find the interview as interesting and educational as I did. On to the review and interview. You've upgraded and tweaked your entire life searching for sonic nirvana. Countless hours of tweaking later and you believe to have achieved the ultimate - nothing could possibly sound better. Right? Wrong! Nothing that I have heard during the past 25 years could begin to prepare for the arrival of Lloyd Walker and his Proscenium turntable. It was quite by accident that I found the Walker table. While surfing the Net three years ago, I came across a reference to the Walker. I pulled up an archived copy of The Absolute Sound and realized that Walker Audio was but a mere 15 minutes from my house. I called Walker, an animated and affable man, who invited me to his home to hear the turntable in his system which was reminiscent of something one would see in a sci-fi movie. Omega Micro cables with their gossamer shielding were strung up everywhere yet carefully positioned so that one never touches the other, all attached to wood-boxed active shield-bias devices. Amps were tubed beasts tweaked by Walker himself and run with their covers off. Speakers were modified Merlins. Resonance control discs and Valid Points were everywhere. The centerpiece of the system was of course the Proscenium turntable sitting in the middle and looking more like an industrial sculpture. A Clearaudio Accurate cartridge was installed which, by coincidence, had similar sonics to my Discovery. 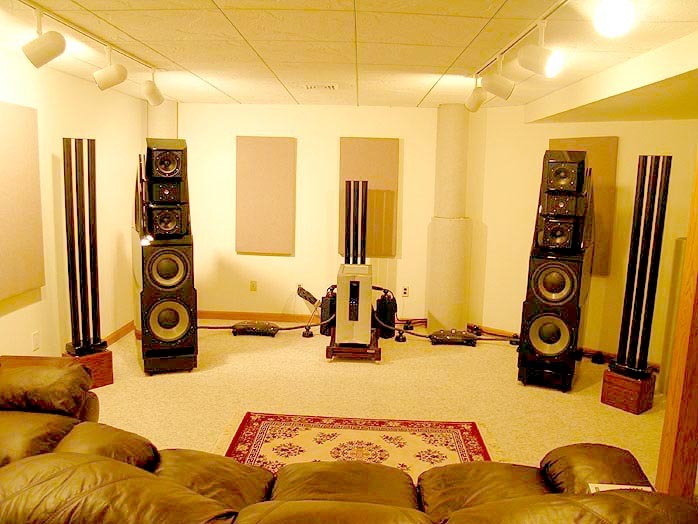 The system was positioned in a virtually empty and somewhat square room which, devoid of almost any acoustical room treatments, didn't seem like the best traditional recipe for great sound. Having brought over several records, I sat in a solitary chair in the center of the room. Lloyd lowered the needle and for over an hour thereafter, I was mesmerized. I heard detail and information that I swear I never heard before. I know it's cliché but I did hear my cherished records for the first time. Yes, I know that some might attribute the sound to the other components in his system which was vastly different from mine. And how do you separate out the turntable from the system components? Good question. That is why I focused on the information retrieval and detail, not the total qualities one normally attributes to speakers or amps. With that said, this still was some of the finest sound I'd ever heard  I was drawn in and drowned. Then Lloyd began to explain the table and show how the many elements of turntable design contribute to its sound well beyond just VTA and VTF adjustments. Walker is fanatical about vibration control, resonance dampening, power quality, cables and polarity, just to name a few. And I was hooked. I had to have this marvel. So what if my children didn't go to college? So what if I tapped into my retirement fund? We're're talking something special here. Four weeks later, Lloyd and his partner Fred Law [above seated next to yours truly] delivered the unit. There are a lot of vinylphiles with far more technical knowledge than I. You might think that you truly understand the intricacies of vinyl reproduction. With all due respect - you don't. I learned more from Lloyd in a few hours than in most of my 45 years of reading and hands-on vinyl experience. The man is an amazing combination of audiophile, engineer and endless tweaker. 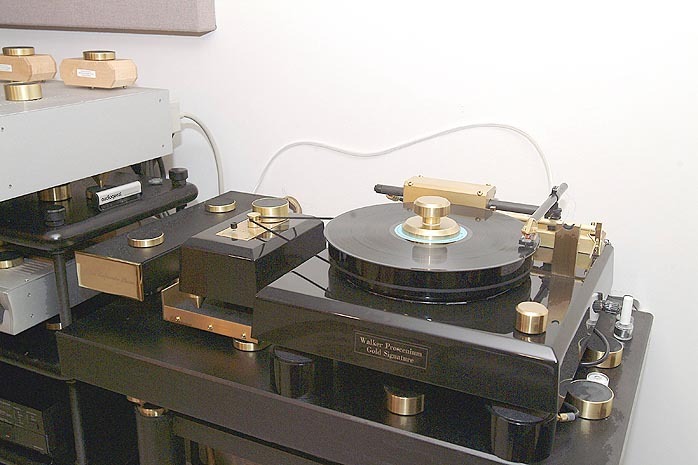 If there is one overwhelming design criterion at Walker, it is to isolate the cartridge from all external forces so that the only movement that occurs is due to the needle in the record groove. Well, so what? You might say that this is the obvious design goal of all turntable manufacturers. It should be - yet Walker has taken it to a most obsessive and fanatical extreme. To Walker, vibration and noise are not just problems, they are the mortal enemy to be eradicated at any cost. He combines solid engineering, first-rate materials and a methodology that consists of design, testing and most importantly - listening. If the result doesn't sound better, Walker goes off into a different direction, no matter what standard design practice might indicate. He thinks outside the box and questions everything. Walker is a mad genius whose careful attention to the smallest of details in pursuit of perfection is clearly evident in all of his designs. The Proscenium Gold is a massive air suspension design. To say it's well made is a significant understatement. The base is crushed marble in a lead and epoxy resin and gorgeous. The Platter is 75 lbs. of encapsulated lead, the most resonance-free material known to man. The platter, carbon fiber tone arm, brass guide and lead resonance discs complete the main table elements. Everything movable -- suspension, arm and platter -- rely on suspension in air which is provided ultra-filtered and damped. not designed to be left on continuously. 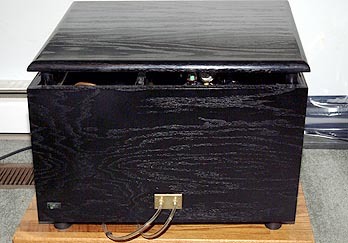 The turntable itself is best described as 'industrial elegance'. There is no doubt that with it in your room, you indeed have something special. As with many of Lloyd's components, lead plays a major factor in his fanatical desire to damp spurious vibrations and resonance in conjunction with the now standard automatic air suspension. The base rests on three 'legs', each containing an industrial air bladder inflated from the high pressure 45 psi air supply line. While they might look alike, the bladder under the arm is larger to support a different load. Each of the three air suspension supports is coupled to the base via a different material to suppress sympathetic vibrations. Small air chambers are located between the suspensions. Walker claims his automatic air suspension design is superior in execution to the Vibraplane. I cannot verify that. However, my previous reference was the VPI TNT IV on both spring and air suspension. I found the air system preferable, offering deeper bass and better definition.